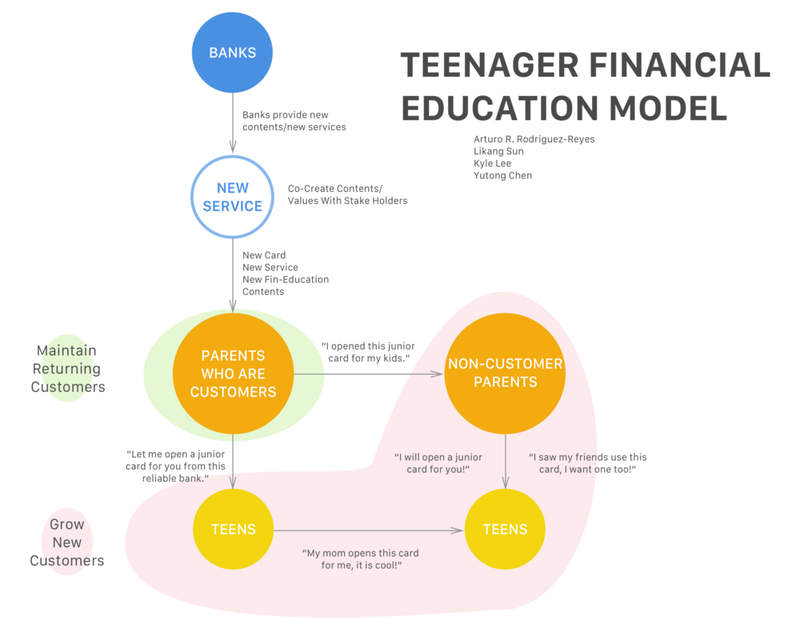 In this group project, we attempted to understand how we could better engage teenagers with finances. With PNC as our clients for this project, we explored different ways to engage teens with their parents to inspire better behaviors, more confidence, and increased responsibility with finances. This project ranged from initial research to developing a service that accomodated the needs we identified. To begin our project, we conducted a number of interviews with various stakeholders in an attempt to better understand the various aspects of the problem of poor financial literacy in teens. We gained many insights from teens, parents, principles of schools, and even bankers. We surprisingly found more interesting insights from younger adults than teenagers. Young adults noted how surprised they were once they had to manage their own finances. They didn’t realize their own ignorance until they actively managed their own finances. From our findings, we constructed a number of models in order to explain our findings. We were namely interested in showing what opportunities we could pursue. In particular, we wanted to examine and leverage the close the relationship with teens and their parents. The most interesting insights actually came from young adults, who regretted not being more financially prepared for the expenses that came along with independent adulthood. Most teens seemed content and unaware with how much their parents were supporting them. We hoped we could empower teens to assume more financial responsibility in their early years to better prepare them for adulthood. After breaking down which aspects people responded well to, we began further developing what our solution would be. We began thinking more realistically about what this service could be, how people could be on-boarded, and what the day to day experience would be. 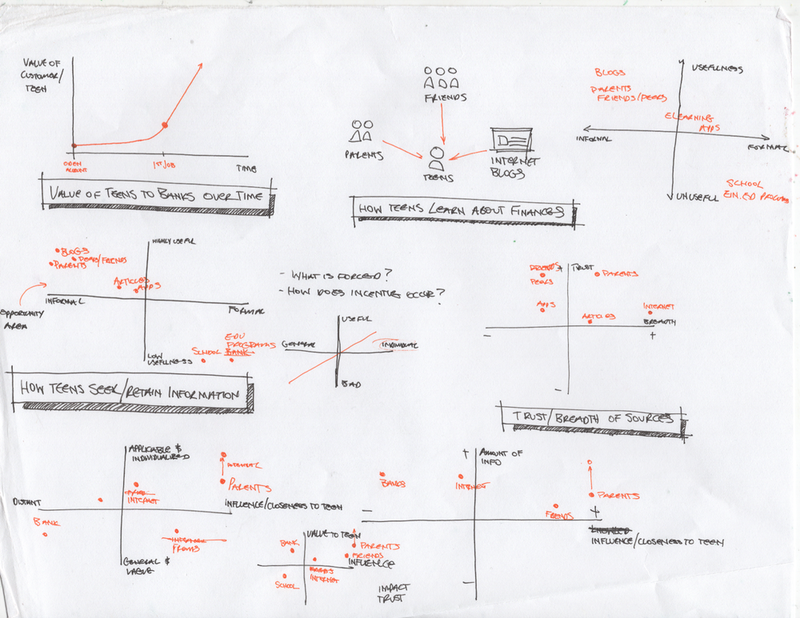 We started broad, then slowly narrowed down to the most promising ideas that would most fulfill our personas needs. We wanted to give teens the ability, experience, and incentive to manage their own money. We then began developing storyboards surrounding potential solutions. What could this solution look like for our personas? What could their lives look like after using our service for a while? What is a compelling story that people respond well to? Where Can We Add Value? Thinking About Stakeholder Needs. After narrowing down to our biggest opportunities, we wanted to ensure that our service in mind would bring proper value to teens, parents, and PNC. We felt confident that our digital wallet would bring value to all these stakeholders. In our service, we wanted parents to give their teens the money to cover all of their expenses, thus allowing them to gain experience as they managed their budgets. Upon creating a budget plan, teens would then track their spending, making sure they stick under their expense caps. If they fail to track their expenses or overspend, their parents would be notified in the next periodical review from where they can either punish their teen but pulling from their regulated allowance. Or if the teen performs well, the parent can reward the teen appropriately. We created a few screens of what our app could look like. In this project, we focused more on the bigger picture of the service rather than the interactions, branding, and UI, but we still wanted to have a preview of what the service could look like. These are a few iterations of our poster which was our final deliverable. The poster started simply by including stand-ins for content. We then began creating models that told the story that we wanted to tell about our service.